Risotto is described as a rice dish cooked in broth to a creamy consistency…. which sounds pretty good to us! Many types of risotto contain butter, wine and onion. It is one of the most common ways of cooking rice in Italy (or so says Wikipedia). 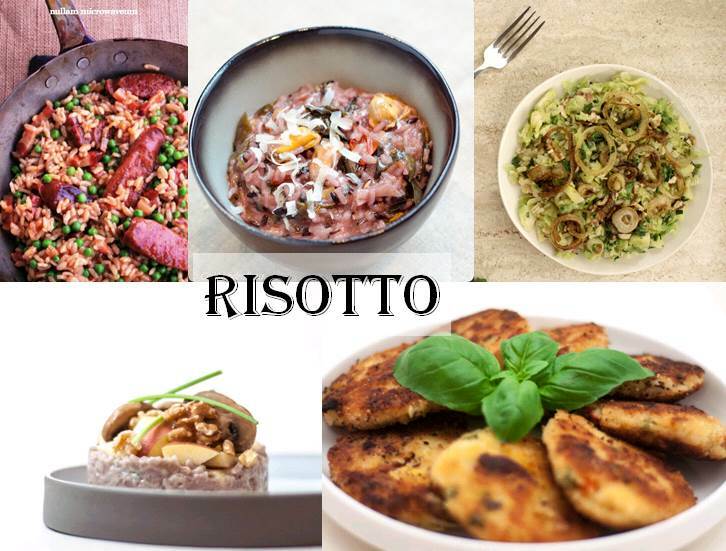 And we thought it was an excellent opportunity to showcase some of our Belgian Bloggers recipes for Risotto! Rob & Elien of Een bord Vol had us drooling over this Risotto with gorgonzola, goats cheese, apples & mushroom dish – but also over their Risotto Cakes! while Jozefien of Goestjes shares a recipe for wheat grain risotto with sprouts & bacon. and finally – Nullam of Nullam Microwaveum shares a creamy risotto with chorizo & green peas with us. Do you have a Risotto recipe that you wish to share with us? Just add the link to the comments section below!